Women of Faith in the Latter Days: Volume Three, 1846-1870 by Richard E. Turley Jr.
We’d love your help. Let us know what’s wrong with this preview of Women of Faith in the Latter Days by Richard E. Turley Jr.. Preview — Women of Faith in the Latter Days by Richard E. Turley Jr.
To ask other readers questions about Women of Faith in the Latter Days, please sign up. There are 23 chapters in this book, each one about a different woman of faith during this time period. Each chapter is actually written by a different author, from well-established scholars to beginning writers and different approaches are taken for each chapter. It also includes sketches of women outside of the United States. This series will consist of seven volumes and the chapters are arranged alphabetically by the last name of each woman. Since it's not in a novel form, you can start with an There are 23 chapters in this book, each one about a different woman of faith during this time period. Each chapter is actually written by a different author, from well-established scholars to beginning writers and different approaches are taken for each chapter. It also includes sketches of women outside of the United States. This series will consist of seven volumes and the chapters are arranged alphabetically by the last name of each woman. Since it's not in a novel form, you can start with any of them. I found it easier for me to read a couple of chapters at a time in between other books I was reading. One of my favorite chapters to read was Chapter 12: "Welcome the Task that Takes You Beyond Yourself," Sarah Louisa Yates Robison (1866-1946), by Patricia Lemmon Spilsbury. She preferred to go by the name Louise. She was the first Relief Society general president to speak in a regular session of General Conference. She stressed leadership development and the importance of making all members feel comfortable. She traveled around and served in several different capacities and was released in 1939. The women in these stories come from all walks of life. Some are highly educated and others have little formal schooling. I related to some of the women more than others. This is during the time that polygamy was a hot issue so a lot of women in these stories were involved in polygamous relationships. Polygamy was abandoned around this time so their chapters include the trials and hardships that came from that. The common thread for each woman in this book is that they each had trials and had plenty of opportunities to exercise their faith and each story was inspirational. This book is definitely worth the read! The lives of these faithful women are inspiring. I feel a greater understanding of how different the LDS culture was during their lifetimes because of their unique challenges dealing with polygamy, developing new homesteads, and struggling to survive. They worked hard to provide for themselves and their families. They were brave, strong, independent, and bold. I didn’t love this one as much as the other two, but I can’t say why. I guess I wasn’t pulled into the history as I was with the previous ones. The women of the Church of Jesus Christ of Latter-day Saints have an impressive legacy. I have always known there were many great women in our history. Bits of their stories have been woven into the lessons I have both taught and been taught over the years but I have never found more extensive biographies except for a few well-known women. I have long wished that more of their stories were published. And now, with Deseret Book’s Women of Faith in the Latter Days series, my wish has been granted m The women of the Church of Jesus Christ of Latter-day Saints have an impressive legacy. I have always known there were many great women in our history. Bits of their stories have been woven into the lessons I have both taught and been taught over the years but I have never found more extensive biographies except for a few well-known women. I have long wished that more of their stories were published. And now, with Deseret Book’s Women of Faith in the Latter Days series, my wish has been granted many times over. I was recently offered the opportunity to review the third volume in what will be a seven-volume series. 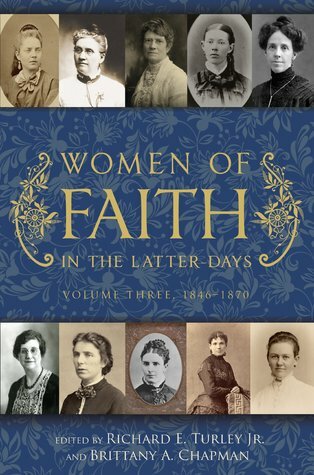 This book contains 23 biographies of strong and valiant Latter-day Saint women born between 1846 and 1870. In perusing the table of contents (to see who was featured in the book as each woman has her own chapter), I found a few names I recognized and started my journey through women’s LDS history there. Yes, I do confess to bouncing around and not reading them in any particular order—and with this book, that works just fine. The lives of these women are inspiring to me. To see all they accomplished, how they overcame tragedy and trials—and how they kept their faith and magnified their lives and their callings humbles me and makes me proud to call them sister. Their stories also remind me that I can—and must—do better and be better. Their accomplishments range far beyond missionary service and church callings. An early doctor, our country’s first female state senator, teachers, writers, mothers, pioneers all—in both the literal and more philosophical sense. As with the first two volumes of this series, Women of Faith in the Latter Days: Volume Three, provides a window into the lives of women in the early church, both those who are well-known and those who are relatively obscure. The format has changed slightly; instead of splitting each chapter into two sections (a brief biographical sketch and then a more in-depth "life experiences" portion), each chapter is now a single continuous piece, seamlessly blending the woman's life experiences with the o As with the first two volumes of this series, Women of Faith in the Latter Days: Volume Three, provides a window into the lives of women in the early church, both those who are well-known and those who are relatively obscure. The format has changed slightly; instead of splitting each chapter into two sections (a brief biographical sketch and then a more in-depth "life experiences" portion), each chapter is now a single continuous piece, seamlessly blending the woman's life experiences with the overarching narrative of her life. It's impossible to describe the full scope of this remarkable book in a brief review. All I can do is give a few glimpses into the discoveries I made in the hopes that you will be intrigued enough to get to know these women yourself. Many of the women in this volume - Emily Sophia Tanner Richards (who is described as "a progressive through and through"), Lucy Emily Woodruff Smith, Clarissa Smith Williams, Louisa Lula Greene Richards, to name a few - were active suffragists who rubbed elbows with famous women's rights activists and attended national and international women's rights conferences. Quite a few women were involved in theatre. Several were career women, including Ellis Reynolds Shipp who earned a medical degree and practiced medicine for 50 years, delivering 6000 babies. The main point that I took from this volume is that the women portrayed didn't think they were doing anything extraordinary. They were trying to get by and live their life and faith the best that they could. The extraordinary part is that they took opportunities/trials that came their way in a positive and life changing way. This book features 23 women born between 1846-1870. Each story has it's own chapter. Each story is submitted by a different person, so there is variety in writing style and The main point that I took from this volume is that the women portrayed didn't think they were doing anything extraordinary. They were trying to get by and live their life and faith the best that they could. The extraordinary part is that they took opportunities/trials that came their way in a positive and life changing way. This book features 23 women born between 1846-1870. Each story has it's own chapter. Each story is submitted by a different person, so there is variety in writing style and the way each person is presented. It was interesting to see how these women viewed life and events with their journal entries. The hard part for me was that many of these women lived with polygamy. This book shows the challenges that many of them had when polygamy was abolished in the LDS church. I didn't realize that women entered the political field during this time. Some of the women were elected to office, that surprised me. About Richard E. Turley Jr.
Books by Richard E. Turley Jr.